Learn from the best! Our Alchemists – Dr. Lucas Esteves and Dr. Vanessa Castro – share their philosophy of work and invite you to learn more at the BSCOSO Winter Course! QUESTION: In your daily practice you combine orthognathic surgery with minimally invasive TMJ surgical procedures. What procedures do you perform on TMJs and in which cases? 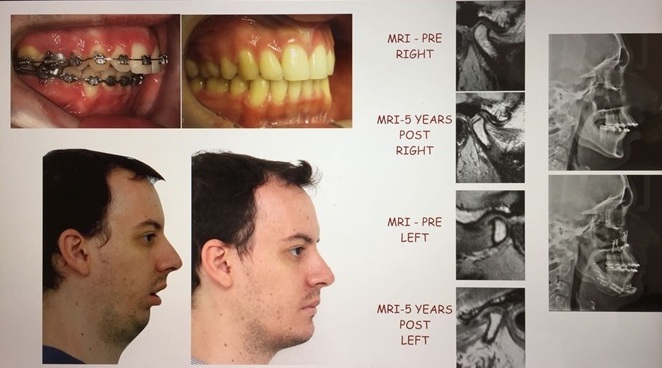 ANSWER: There are pathologies in cases of which we always perform TMJ surgery in our practice, mostly if pathologies represent pain and instability of TMJ or functional disorders, like: active condylar hyperplasia, ankyloses, autoimmune disease (example: rheumatoid arthritis), absence of TMJ (examples: hemifacial microsomia, syndromes), IACR and reactive arthritis, end-stage TMJ degeneration, redo surgery, TMJ trauma (example: fracture), severe pain in counterclockwise rotation (when conservative treatment had been ineffective). QUESTION: When and how do you select cases for simultaneous orthognathic surgery and disc repositioning? ANSWER: We evaluate clinical aspects, MRIs an d the Magnitude of movement! Never our decision is based on MRI only. But, if the patient is symptomatic, normally we perform disk repositioning and orthognathic surgery simultaneously. QUESTION: What long term MRI studies reveal about the outcomes of such simultaneous procedures? ANSWER: We perform MRI at least six months after surgery. Most of the time, we notice that the disks stay in stable position after TMJ surgery. In patients that had disc displacement without reduction the results are not so predictable! Here we present stable results with MRI based evidence 5 years after surgery. QUESTION: When you plan faces, what is the first and the most important step? ANSWER: In our practice, the first step is the 3D incisor positioning (vertical, midline, cant, angulation, yaw). When we combine with the rest of the teeth of the maxilla and mandible, we decide the occlusal plane angulation, the position of the Pogonion and lips, the width of the face, the 3D position of the chin (AP, vertical, midline, cant and yaw). All the steps are essential for a great result! QUESTION: What is the ratio of single jaws vs bimaxillary orthognathic procedures in your daily practice? Multi-segmental vs single piece maxillas? ANSWER: We find single jaw procedures applicable for 9 percent of our patient population, whereas 91 percent receives bimaxillary osteotomies. Eighty prevent of maxillas receive multisegmental Le Fort I osteotomies. Planning is the key for success!